Please click here to here access the archive of results back to 1970. 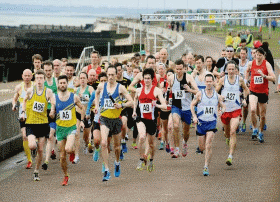 The county senior and vet road relays are held at the seafront at Harwich over an officially measured 5km course. The race is also open to teams that do not meet the Essex qualification criteria although such teams will not be awarded any county medals. Please be aware that some Sat Navs may try to take you into a local Caravan Park. 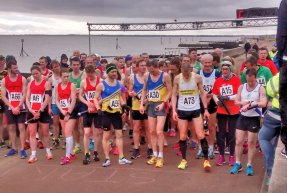 For the 5th consecutive year Harwich Runners hosted a record turnout as 114 teams, out of the 126 entered, contested the Essex Road Relay Championships. 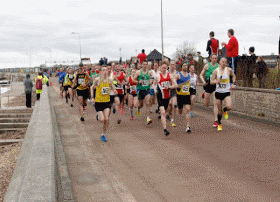 Never a windless venue at the best of times runners this year had to battle against the back end of storm Gareth with gusts up to 40mph along the promenade. Nevertheless some very strong teams packed with quality made the trip with the competitive edge of a relay championship producing some very fast times, 25 runners clocking sub 17 minutes or better. Tom Frith of Southend was the fastest man of the day and LIz Davies of Springfield Striders the fastest woman. 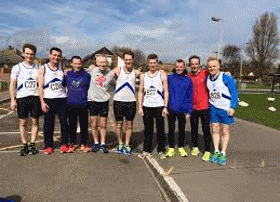 Their respective recordings of 15.40 and 17.33 for the 5k loop were exceptional in the conditions.